Sometimes, we find certain types of cuisine pigeon-holed as cheap simple food. Well, that is partially due to the limited representation locally. 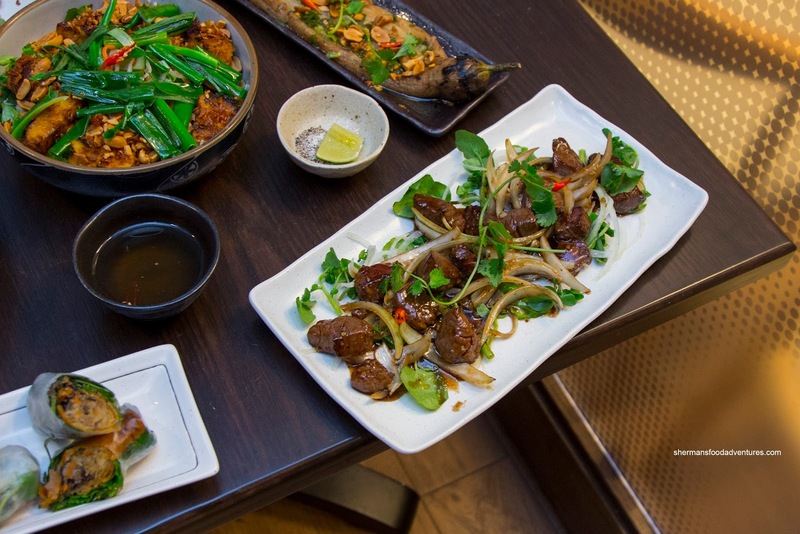 One of the most obvious examples is Vietnamese food. 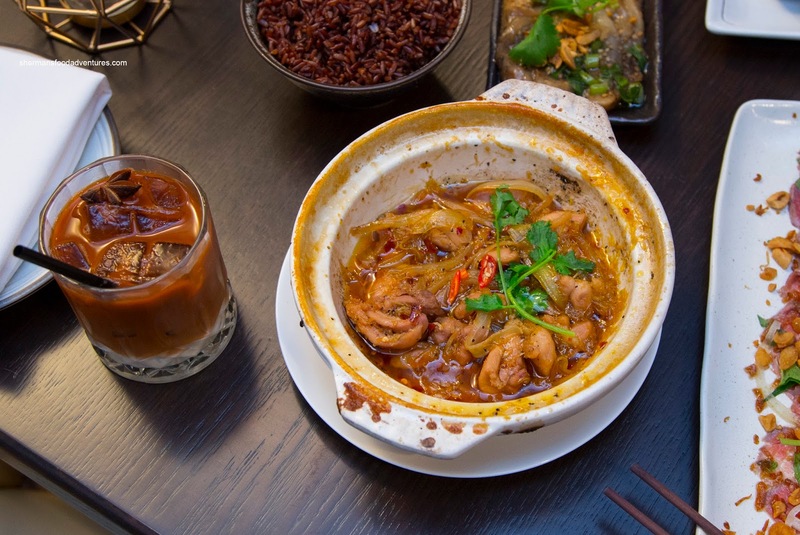 Completely over-represented by Pho and even more specifically South Vietnam, we only get a snapshot of the culture and cuisine. 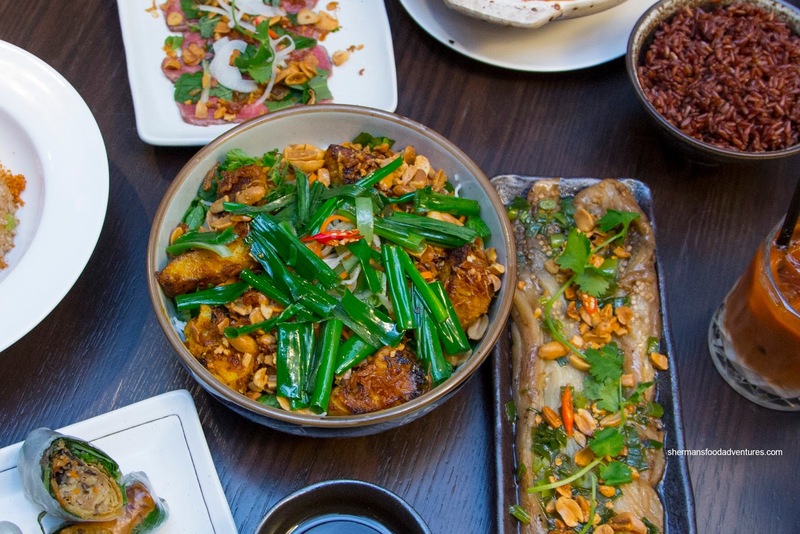 However, with the trend moving towards clean and specifically-built modern restaurants, we find Vietnamese food being more refined, diverse and of course more expensive than the typical Pho joint. 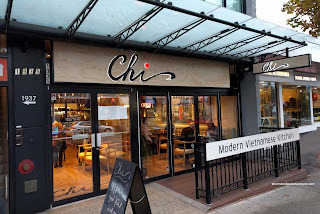 The newest one to hit the town is Chi Modern Vietnamese Kitchen run by former runner-up of Masterchef Vietnam, Chi Le. Along with Nora, Sharon and Jacqueline, I was invited for a taste of their most popular items. We got down to it with some appies including the Bo Tai Chanh (Beef Carpaccio) and Cha Gio Vit (Crispy Fresh Duck Rolls). Sliced semi-thin, the tender Snake River Wagyu beef was buttery and soft. 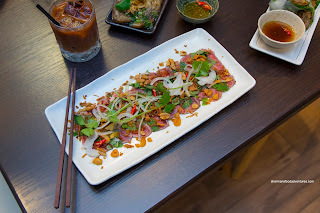 The garnishes of lime, onion, cilantro, roasted peanuts, red Thai chilis and crispy shallots added both aroma and naturally an Asian flavour to the dish. 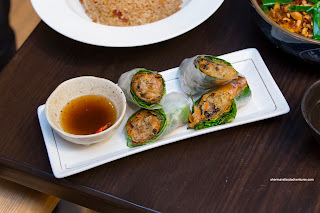 Despite incessant picture-taking, the crunch of the spring rolls didn't dissipate. I liked how there was an initial and lingering herbaceousness from the first bite. There were plenty of sous-vide duck inside the roll which was fairly tender and appealingly gamy. 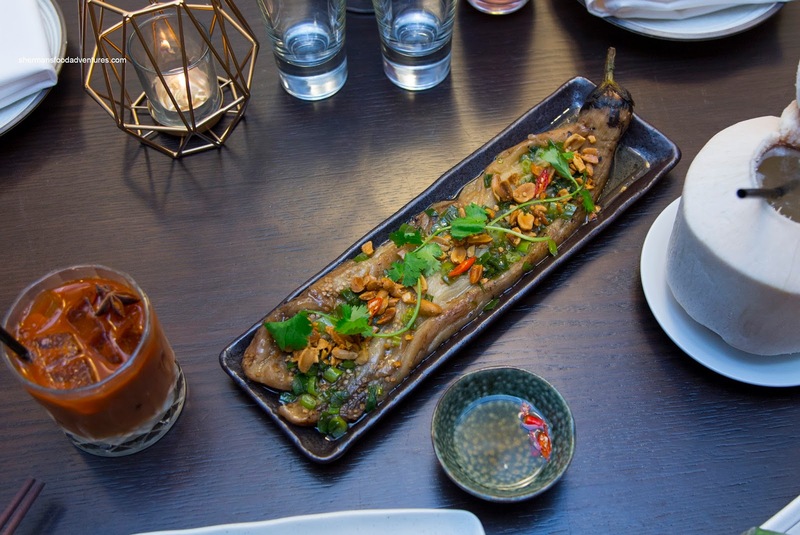 Although prepared expertly, the Ca Nuong (Chargrilled Eggplant) was one of the least impactful in terms of flavour. It may have been possible that this was the intention as eggplant on its own is generally not flavourful. There was a noticeable smokiness though that was accented by the roasted peanuts and light saltiness of the fish sauce.. The red chilis were not particularly noticeable, unless we intentionally picked one up with the piece of eggplant. Texturally, the eggplant was on point being soft yet not mushy. At first, the Ga Kho To (Lemongrass Chicken Hot Pot) tasted overly sweet, but that was nicely balanced by the saltiness of the fish sauce and then subsequently by a lingering spice from the chilis. I loved the use of the chewy and firm red rice as it stood up to the sauce well. Beautifully seared on the outside, the Bo Luc Lac (Shaken AAA Beef Tenderloin) was tender and nicely caramelized. The inherent flavours were mild with a bit of sweet saltiness. 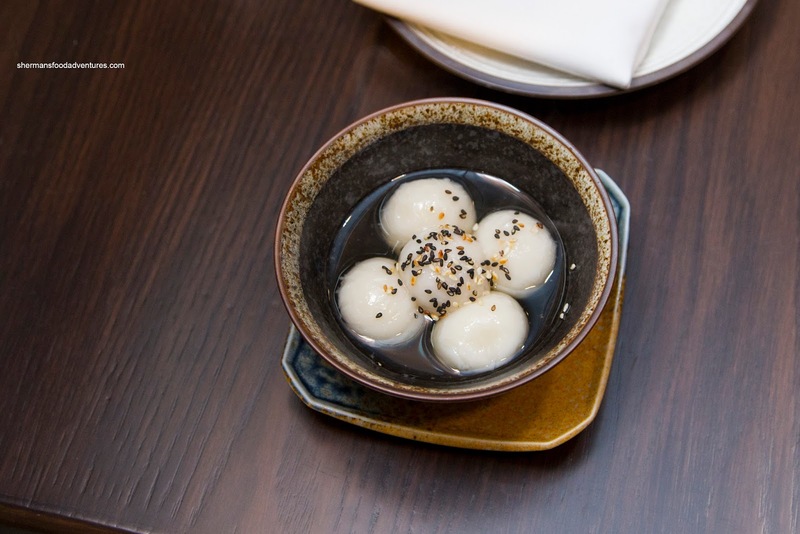 However, with the side of salt, pepper and lime, it added the necessary acidity, salt and slight kick that elevated things. 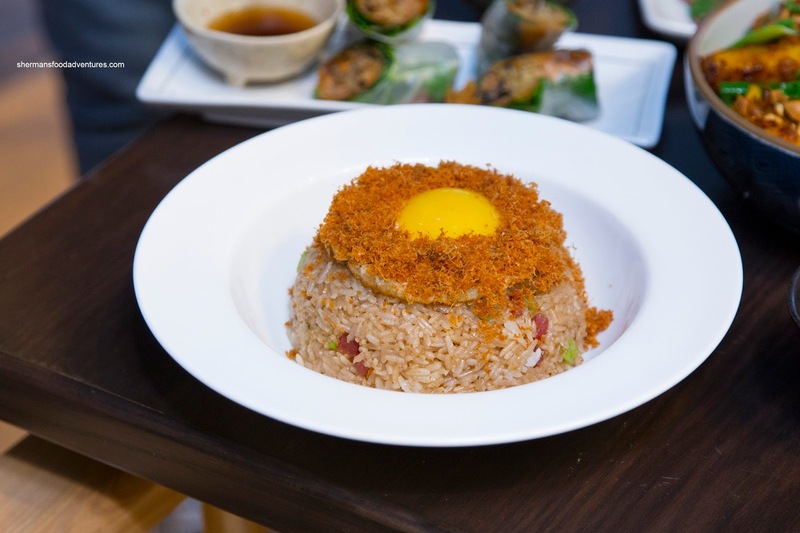 Our consensus favourite dish by a mile was the Com Chien (Chi Fried Rice) with cured sausage, onion, runny egg and garlic-ginger crumble. If there was perfection in fried rice texture, this would be it. Each grain was chewy and nutty while caressed by the silky runny yolk. The wealth of flavours were strong including initial caramelized sweetness and then giving way to the chewy saltiness of the sausage. I could've eaten this all by myself. Topped with a plethora of green onion, the Cha Ca La Vong (Black Cod Vermicelli) was a pleasant dish, but had a hard time following up the fabulous rice dish. Underneath the turmeric and galangal-encrusted buttery black cod, the chewy vermicelli was loose and not clumpy. A dousing of the side fish sauce and there were plenty of salty sweet flavours at play. Also bursting with impact were the Canh Ga Chien (Chicken Wings). 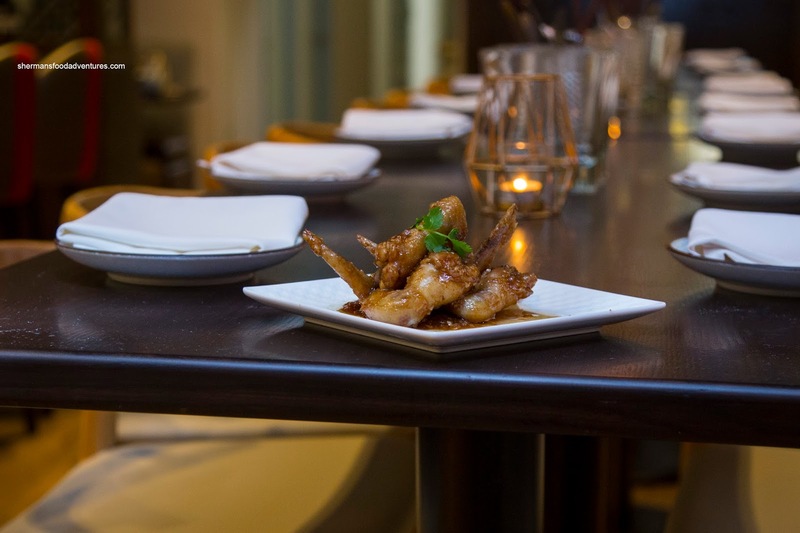 Dressed in a thick and syrupy sauce, there was an immediate tamarind tartness followed by a rich sweetness. Mixed in was the usual garlic and ginger. The only thing I would've liked to see was a crispier and more rendered skin. As simple as the So Diep Song (Atlantic Sea Scallop) appeared, the flavours were clean and impactful. 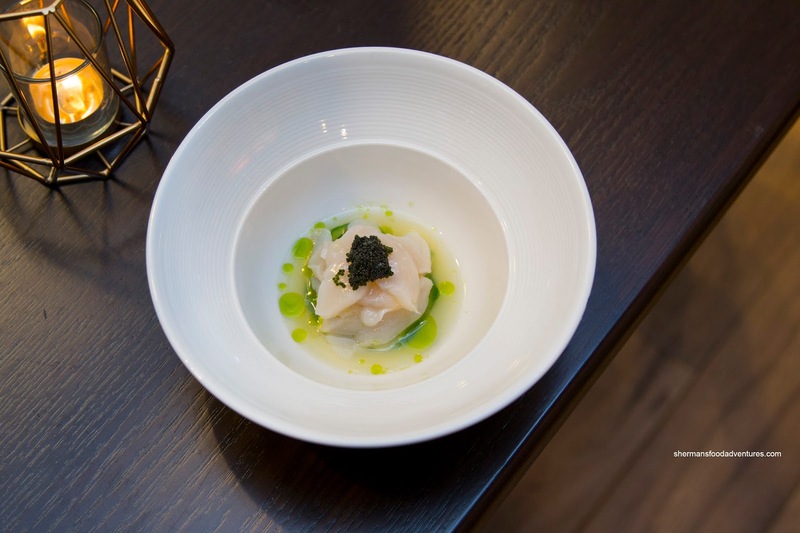 The combination of lime, lemon, key lime and kalamansi juices made for a complex citrus hit that worked well with the buttery and sweet scallop. There was a background heat provided by red Thai chilis infused into the dressing. For dessert, we were served the Durian Rice Balls sitting in a simple syrup. I found the glutinous rice shell to be soft and pillowy while the durian filling was pungently sweet, but not overbearing. This was a fine way to end a meal that featured a wealth of impactful flavour and mostly on point execution. It's nice to see that Vietnamese cuisine has been elevated and better represented within the GVRD.